Central idea: Sin and its remedy. Doctrine: Concupiscence and self-mastery. Practical application: Lenten activities. To view Lectionary 23, click here. One of the overarching themes of the Bible—both the Old and New Testaments—is God’s desire for friendship between him and human beings. One of the ways this friendship is offered is through covenants—solemn, unbreakable agreements. God established a covenant for humanity through Adam, Noah, Abraham, Moses, David, and finally Jesus Christ. According to Genesis, God destroyed every living land creature, except those who escaped in the ark: the righteous Noah and his family and the animals. This destroying and cleansing flood was due to the earth being full of irreformably wicked persons. God does not need to be reminded of anything. We do. So, every time we see a rainbow, we should use it as a reminder that God desires friendship with humanity, but a friendship that is not a free pass for us to do evil. 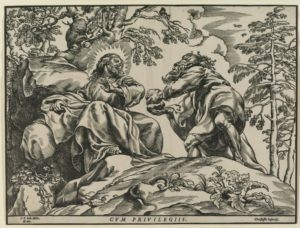 From the beginning, the Church has seen the deluge of Genesis as a “type” or image or symbol or foreshadowing of the Sacrament of Baptism, as we will see in the second lectionary reading. “Your ways, O Lord, are love and truth to those who keep your covenant.” The first Christians called God’s New Covenant given to us by Jesus Christ the Way. Christ’s way is the way of love. It is God’s love which flows from the humanity of Christ to us and then back to our neighbor and Him. We have to learn what love is, and this takes time—for some a whole lifetime—and so we ask God to teach us how to love and to give us time to do so. God’s way is for those who do not know how to love so well yet, and who sin, but who humbly acknowledge that they need to be shown the way and to be helped on the way. This way is for humble sinners. Jesus Christ, the righteous, suffered, died, and rose from the dead for the benefit of every one of us, the unrighteous—for those of his own generation to whom Peter ministered, to all those who had already died—the “spirits in prison who had once been disobedient”—and for all future persons, including us. Just as Noah and his household were “saved through water,” we are now saved through water, too, the waters of baptism. It is an appeal, that is, we ask for it, either directly or through our sponsors. It is a request for a clear conscience, that is, that our sins be forgiven and that we be given “life in the Spirit.” But it is more than just a request. It really does that through the resurrection of Jesus Christ. Our Lord ended his ordinary, hidden life and inaugurated his public life with his baptism by John at the Jordan. Then he endured forty days of penance as immediate preparation. Then he began his public ministry in Galilee. We imitate Christ’s forty days in the desert with our forty days of Lenten discipline each year. Christ completely fasted for forty days—the limit of human endurance—so his discipline was much more severe than anything we undertake. Yet, unlike Christ, who was only tempted from without, we are also tempted from within, because we have concupiscence. Christ was physically hungry for food but when we give up anything our entire being seems to go into rebellion. Two of the ten commandments focus on concupiscence specifically: do not covet your neighbor’s wife or goods. Covetousness is the inordinate desire to possess what you don’t have a right to. It is a sin when the desire is consented to. This is why it can be a sin even if it is only in one’s mind. Concupiscence is that inordinate desire. It is our inclination to sin (CCC 1254). Concupiscence comes from sin, leads to sin, is an evil, but is not itself a sin (CCC 2515). It comes from sin because it is a consequence of the sin of Adam. It leads to sin because it tempts us to sin. It is an evil because it is not good for us to desire something that is wrong. And it is not itself a sin because to have a desire or impulse is not morally blameworthy without consent. Concupiscence is a kind of birth defect every human being has, due to original sin. It would be like being colorblind if the most important thing in life was to be a paint salesperson or to be born with one leg shorter than the other if the most important thing in life was to be a runner. A most important thing in life actually is to be just—to give God and our neighbor what we owe them—but the disordered desire of concupiscence is constantly inclining us toward injustice. John the Apostle identifies three kinds of concupiscence: “Lust of the flesh, lust of the eyes, and pride of life” (CCC 2514). These refer to the “pleasures of the senses, covetousness for earthly goods, and self-assertion, contrary to the dictates of reason” (CCC 377). Sensual pleasure is good, but the desire to enjoy it can lead to all kinds of sins, including adultery and murder (in the case of King David). Earthly goods are also good, but the desire for them can lead to all kinds of sins, including beating and robbing and nearly murdering an innocent person (as in the parable of the Good Samaritan). Being highly esteemed by others is also a good, but the desire for it can lead to all kinds of sins, including lying about your exploits or foolishly boasting (as in the case of the Pharisee who was glad he was not like the tax collector). Concupiscence is the “movement of the sensitive appetite contrary to the operation of the human reason” (CCC 2515). You desire something so you act according to that desire, without thinking or even despite your reason telling you it is wrong. It is essentially the tyranny of one’s passions over one’s reason. A simple example is dieting. Using your reason you have decided to diet. Many times a day, you will have the impulse to eat. Which voice will prevail over your will? The voice of reason which says to stick to your diet, or the voice of desire to eat? Of course, going on a diet is not usually a moral matter, but gluttony or a refusal to fast when the Church has required it of a Catholic is. The wound of concupiscence is why the Christian life requires the self-mastery that comes from growth in virtues. While concupiscence is an evil we have to deal with every day of our lives (CCC 2516), “it cannot harm those who do not consent but manfully resist it by the grace of Jesus Christ” (CCC 1264). Sins or faults to stop: criticizing others, gossiping, looking at sexually attractive images, not doing a task immediately, constantly looking at yourself in a mirror, taking God’s name in vain or using crude language, telling “white” lies. A positive activity to deepen your prayer or spiritual life: making a morning offering, attending an additional Mass during the week, saying a decade of the rosary while doing some routine activity, saying please and thank you, saying “God bless you” to people, praying for each family member by name, praying at an abortion clinic, attending a parish faith enrichment class or event, reading a Gospel for five minutes each day, saying an act of contrition at the end of each day and whenever else you need to, going to Confession each week of Lent. Giving up something you like or are attached to: Giving up Ramen, denying yourself the snooze button, stop watching a particular genre of YouTube videos, wearing your second choice outfit, only checking email or Facebook at specific times, no cream or sugar in your coffee. Undertake your Lenten activities consciously. Their purposes are to remind us of our friendship with God and to strengthen that friendship through little acts of love, despite the rebellion of our concupiscence. So, if you plan to do your chores at once, say a decade of the Rosary while getting dressed, and not text anyone during the school day, offer these things up to God over and over, asking him to help you overcome your sins and to grow in freedom to love him and your neighbor.